Be the first to share your favorite memory, photo or story of Cheri'. This memorial page is dedicated for family, friends and future generations to celebrate the life of their loved one. 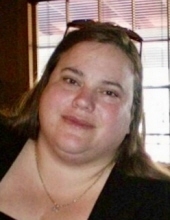 Cheri’ Lambright Young passed away on March 30, 2019 in Fort Mill, SC. Visitation will be held on Friday, April 5 at 6 p.m. with the memorial service to immediately follow at 7 p.m. Services will take place at the Upper Room Chapel, 8409 Regent Parkway, Fort Mill, SC. Tragically, Cheri’ ended her own life – a fact her family has chosen to share to raise suicide awareness and to encourage anyone who has struggled with suicidal thoughts to please reach out for help. Cheri’ was born in Austin, Texas in 1970 to Pastors Ron and Sue Lambright. She married Freddie Young on February 14, 2000 and they were married for 19 years. She joins her mother, Sue Lambright, in Heaven. She leaves behind a family who loved her dearly, including her husband, Freddie Young; father and bonus-mother, Pastors Ron and Phyllis Lambright; her children, Rosie Grennan, James Grennan II, and Linda Kott along with her husband Brandon; two granddaughters, Skylar and Brooklyn Kott; a sister, Michelle Black along with her husband Donald; her nephew, Nathaniel Black; her nieces, Gabriella Black, Nicole Cregger, and Heather McCraw; father-in-law, Ray Young; and a host of aunts, uncles, cousins and friends who miss her greatly. In lieu of flowers, donations can be made in Cheri’s name to the Fort Mill Care Center, P.O. Box 1401, Fort Mill, SC 29716, www.FortMillCareCenter.org. Palmetto Funeral Home and Cremation Service of Fort Mill (803.802.7788) is assisting the family. To send flowers or a remembrance gift to the family of Cheri' Lynnette Lambright Young, please visit our Tribute Store. "Email Address" would like to share the life celebration of Cheri' Lynnette Lambright Young. Click on the "link" to go to share a favorite memory or leave a condolence message for the family.